Lava Shells are a new and exciting product to enter the world of massage. 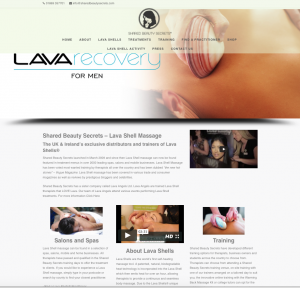 As exclusive distributors and trainers of Lava Shell Massage throughout the UK and Ireland and owners of Lava Angels Ltd, Shared Beauty Secrets rely greatly on their online image. It goes without saying that a sleek, responsive, accessible and fresh looking website was a must. Village Web Design was drafted in to modernise their site and reduce the rather expensive editing costs and address the niggly problems that too many business owners are familiar with, such as hard-to-edit content and low readership levels. With our expertise and extensive knowledge of WordPress sites, we were able to create a seamless website that is oh-so-easy to edit and upload new content plus add news without the hassle they went through with their old website. As part of this, we built an accessible online shop complete with various levels of access appropriate to individual customers.